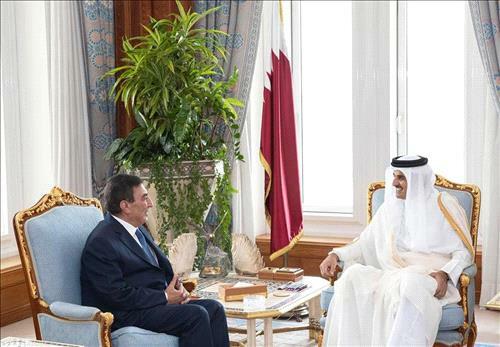 AMMONNEWS - Speaker of the Lower House of Parliament, Atef Tarawneh, Wednesday delivered an oral message from His Majesty King Abdullah II to Emir of Qatar Sheikh Tamim bin Hamad Al Thani, expressing His Majesty's good wishes to the Emir and the Qatari people. Sheik Tamim received Tarawneh, who is the president of the Arab-Inter Parliamentary Union, at the end of the 140th assembly of the Inter-Parliamentary Union (IPU) held in Doha, and led the Jordanian parliamentary delegation comprising of seven representatives and two senators. At a meeting in the Qatari capital, Sheik Tamim underscored the importance of orchestrating Arab efforts to support the Palestinian cause, stressing Qatar's support for the Hashemite custodianship over the Islamic and Christian sanctities in Jerusalem. For his part, Tarawneh said the Palestinian cause is at a crossroads and needs uniting efforts, pointing to the parliamentarians' role in "building bridges of cooperation for the sake of supporting the Palestinian cause at all international platforms".
" We, in Jordan, stand united behind His Majesty in his defense of the Palestinian cause and in protecting Jerusalem, emanating from the Hashemite custodianship over the Islamic and Christian holy sites in the city, " Tarawneh pointed out.